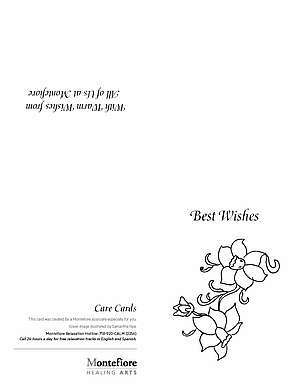 We are pleased to invite all Montefiore associates to create a special "Care Card," which are given to patients as gifts to brighten their day while in hospital. 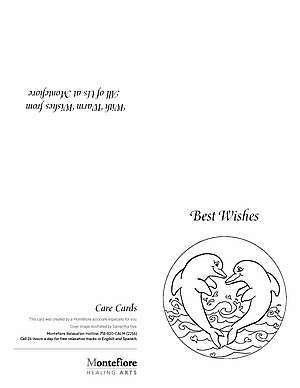 Associates are invited to color the illustration on the front of the card and to include a positive message inside. Please carefully read our Care Cards Instructions for important information before beginning this project with your team. Please send your completed cards via interoffice mail to: Healing Arts Program, DFSM. 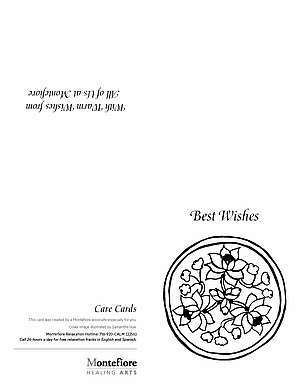 We hope you will enjoy the relaxing experience of coloring in the cards! Thank you for participating. For more information, please email HealingArts@montefiore.org.